I installed this over a spa tub in my last home everyone who came through for the open house loved this chandelier and insisted it came with the home; which it did. Thank you overstock. 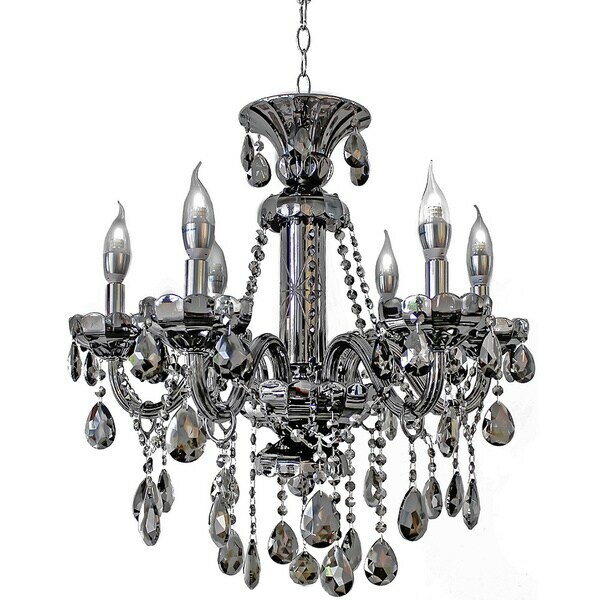 This stunning candelabra chandelier will light up your home with elegance and class. A stunning smokey grey frame and glistening crystals ensure that this chandelier will be a great focal point of any room. 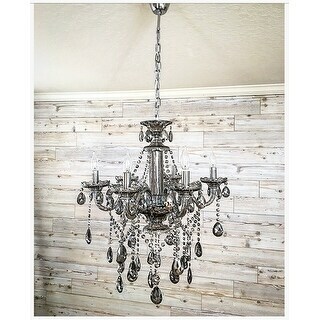 This is a total replica of the zgallerie chandelier but for a way better price! This is an awesome light fixture. Even though the style is traditional, the mirrored silver gives it such an updated look. And the price is fantastic ! This is a beautiful chandelier. Didn't take too long to put together, and turned out great in our dining room. Sparkly yet sophisticated. Great color and good value. If I had a bigger dining room, I'd probably look to get a bigger version with more lights, but this is good for our current needs. Love this beautiful 6 light mirrored chandelier!! It's a good size and looks just elegant in my dining room !! I get so many compliments on it !! The color is slighty lighter then pictured but dose not take away from its beauty!! Can't wait to order another one for a different room ! I loved the chandelier as soon as we started taking it out of the box. It looks just like the picture. It is a smoky Chrome look and it is super shiny.we haven't even put it all together yet and I'm just so excited to do that.all we have left to do is hanging the crystals on the chandelier and it looks like it's going to be a pretty easy job. The chandelier is exactly the look that I was going for. Gorgeous. Came with a broken ring and the company sent a replacement very quickly. Looks even better in person. We hired an electrician to hang this for us. this looked beautiful, but I had to send it back becasue it came with broken pieces and missing pieces, however it did look beautiful. "would this be good in a bedroom"
"Does this need to be hardwired? " Yes, this fixture needs to be hardwired. "Is there more chain available? I have 16' ceilings"
The chandelier is not available. Fell in love with a similar chandelier from z gallerie that was double the price. Came to overstock and successfully found a cheaper look alike- hopefully it is as beautiful in person.